Plato said, “Music is moral law. It gives soul to the universe, wings to the mind, flight to the imagination, and charm and gaiety to life and to everything.” Give your children the opportunity to learn how to play a musical instrument or take singing lessons. Music can benefit your young ones greatly. Fill your children’s world with songs and joy. Music isn’t only enjoyable, it helps with brain development. Start playing songs for your children while they are young to increase their intelligence. Studies show that children who play instruments do better in school than those who don’t. Playing an instrument helps the brain create new pathways. Music and rhymes can also help your children with memorization. Music won’t just help them now, it will also help them as they grow into an adult. Playing an instrument and learning to sing can teach your children discipline and responsibility. These are some characteristics they will need as an adult. Your kiddos will learn how to spend their time wisely when they practice and they’ll learn that the more effort and work that they put in, the better they will get at what they do. Your children will not only learn be disciplined and responsible, they will also learn how to listen carefully and really focus and concentrate on what they’re doing. Another benefit that music has on children is that it teaches them how to be patient. Learning how to sing with proper techniques or how to play a piece can take a lot of time. Perfection doesn’t typically happen overnight. Your kids will learn how to work hard and be patient with themselves as they learn something new. As people get older, life gets more and more stressful. They have to juggle between work and school and socializing, and it’s difficult to find any peace of mind. Playing music and/or singing can help your young ones de-stress when they grow up. Music can help people manage their emotions when they’re feeling trapped or down in the dumps. Your children can use their voices or their ability to play an instrument to express what they are feeling when words fail. Just as music can help people through negative times, music can also help with positive self-expression. Music is an art that really helps bring people together. It’s a language that all people can understand. Giving your kids the opportunity to sing songs and play instruments can help them make friends and teach them how to communicate with others. 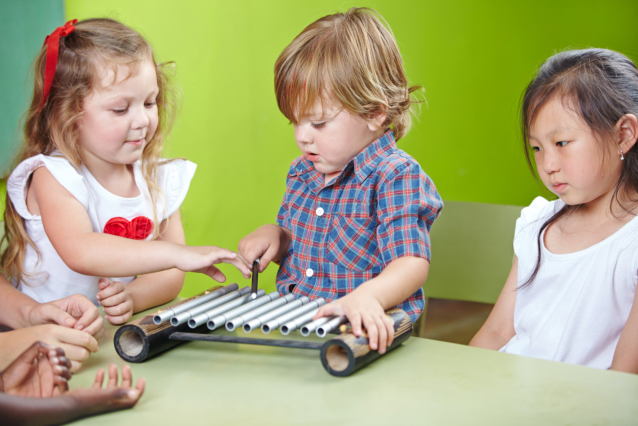 Group settings that involve music, like choir or band, can teach your young ones how to work together with children their age. Let your young ones reap the benefits of singing and playing an instrument. Give them the opportunity to learn something new today. Get your children a music instructor or a singing teacher. If you’re looking for Child Care and are living around Las Vegas, Nevada, contact Kids Learning Path today. We will get your on the path to a successful future. Give us a call at give us a call at 702-456-4986.